One of my readers left a comment saying that my previous post left him high and dry when it came to creating the client project for testing his service. So I put this very quick post together to describe it for him and hopefully for others too. 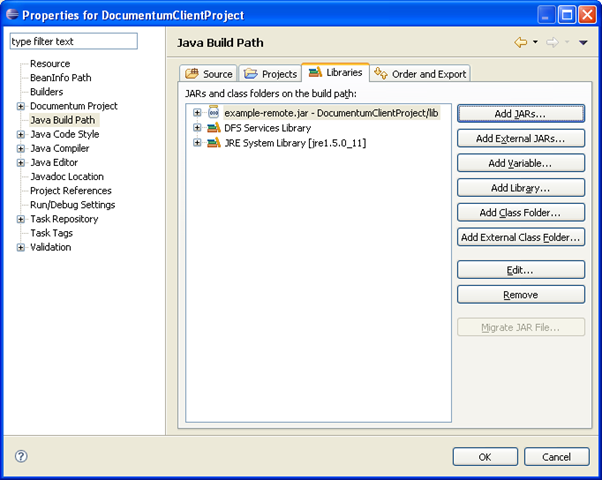 First this to note here is that there are lots of ways to create a DFS Client spanning both Java or .Net. 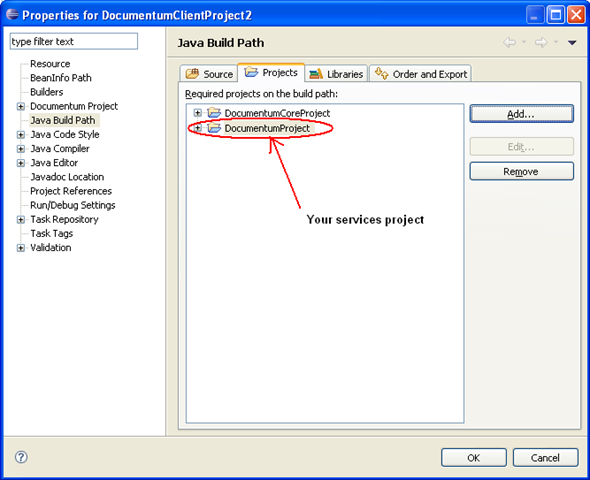 This is just one way using Documentum Composer. So where did the previous post end up. Well we had created a Documentum Project and within that created a DFS service, exported it as a service archive and deployed it onto a suitable application server. Create yourself another Documentum Project (File->New->Other->Documentum Project). Next create yourself a lib folder and in it import (Import->File System) your services remote jar. This will have been exported at the same time as your service archive. If you called your service archive samples for example then you would look for samples-remote.jar. 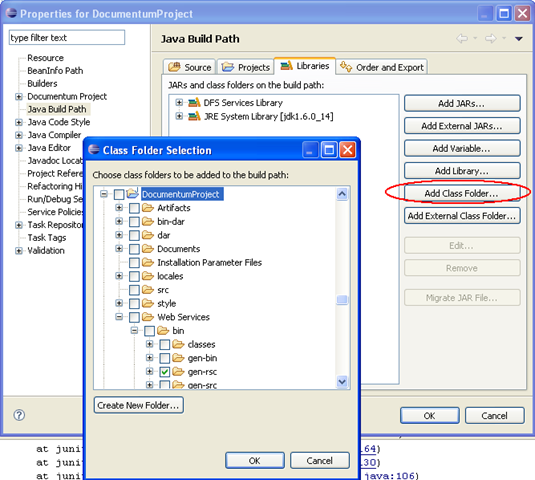 Obviously we do want to add Junit 3 library to the project’s class path so choose to perform that action. Click Ok.
Because we already configured the project with a DFS class path you can hover over the problem marker in the sidebar and use the quick fix to add the necessary DFS imports. That is pretty much it. Make sure your services are deployed and that the server is running and the wsdl for each service is available. 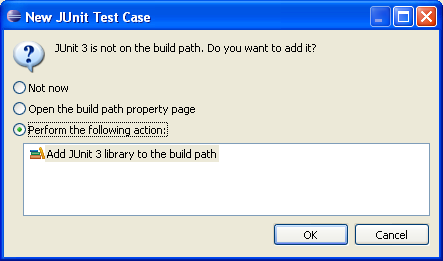 To run the Junit test right-click on it in the project explorer and select Run As->Junit Test. 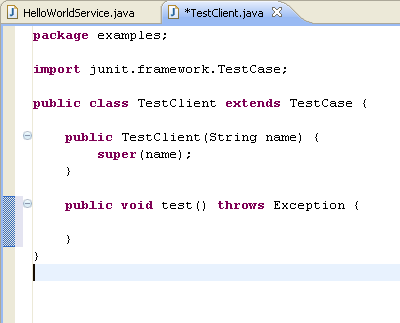 This will execute your test case using the Junit test framework and display the results. 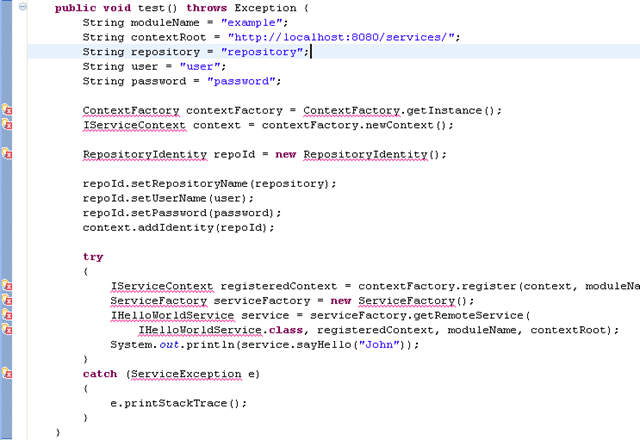 If you want to debug the code then set a break point in the code and select Debug As->Junit Test instead. Now it is important to note that DFS supports two modes of invocation; remote – as we outlined above. But it also supports local invocation too. This provides us with an alternative way to test our service code with less fixture than the remote alternative; i.e. without having to deploy it to a server. First we also need to add some of the services’ resources to the services project’s class path so that the DFS runtime can find them. The Ear is configured in such a way that these same resources are available on the class path when the Ear is deployed on an app server. We are just mimicking this configuration. That’s the services project configured. Now create another Documentum client project. 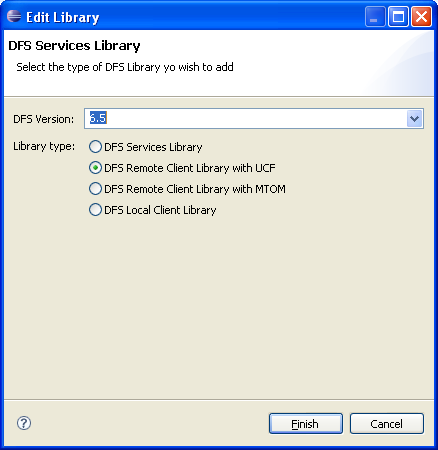 As before edit the type of DFS Library Path but select “DFS Local Library”. There is no need to add the remote jar as we will pick up the service classes directly from the project. And that’s it. You are ready to go. 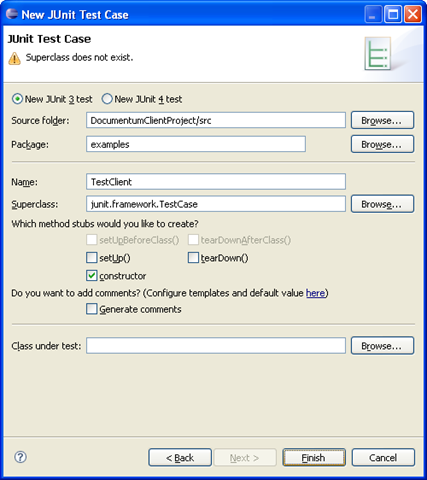 Right-click on the Junit class in the project explorer and select Run As (or Debug As)->Junit Test. So we’ve walked through creating a remote DFS Consumer and looked at an alternative for creating a local DFS consumers that leverages DFS’s local invocation facility.